- Cobbles Sizes: 10x10 cm, 10x20 cm, 14x14 cm, 14x20 cm Etc. A Granite cobble Stone is a hand chiseled natural paving stone that tapers from top towards bottom surface which provides perfect setting. Available in wide range of size and thickness, they can be used on all low, medium & heavy traffic areas. Innovative ideas have used these in medley of aesthetic patterns. In order to decorate the flooring and walls of home and offices Granite Cobble is used. 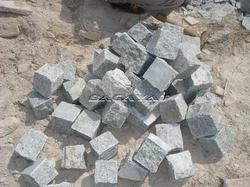 The Granite Cobble we offer is available in the market in different patterns and designs. These products are widely demanded by the clients for their durability and stain free nature. - Usage: Houses, offices, etc. Our organization is completely devoted towards providing quality assured Granite Cobblestone. As the most reputed Exporters and Suppliers of Granite Cobblestones, we deliver a range of Cobblestones that lend a rustic charm to Patio, Paths and Driveway borders. Available in warm colors of Grey, Yellow, Pink, Black etc, our Natural Cobblestone can be laid in a variety of patterns and sizes as desired by the customers. 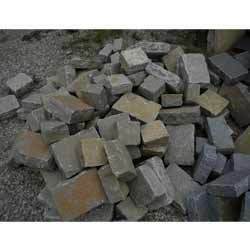 With immense market knowledge, we have been able to provide optimum quality Granite Cobble.